One of the popes with a special place in the history of Monaco was His Holiness Pope Paul III, the first Roman Pontiff to ever visit the principality. He was also a figure who embodied both good and bad aspects of the Renaissance papacy but also a great reformer. He was born Alessandro Farnese on February 29, 1468 in what was then the Papal States. His family, the Farnese, were a very old Italian family who had gained great success over the years and aside from gaining high position in the Church also became the Dukes of Parma. His mother was from the also well-placed Caetani family which included among its members the controversial Pope Boniface VIII in the Middle Ages. Young Alessandro Farnese was given the best education money could buy, studying at the University of Pisa and at the court of Lorenzo de Medici. Throughout his life he was immersed in the glorious atmosphere of Renaissance Italy. He learned to appreciate great art, great literature, philosophy and the art of unscrupulous political advancement. In 1491 he was given a place in the Curia and in 1493 Pope Alexander VI made him a Cardinal-Deacon. He proved impressive and Pope Clement VII later made him Cardinal Bishop of Ostia and dean of the College of Cardinals. 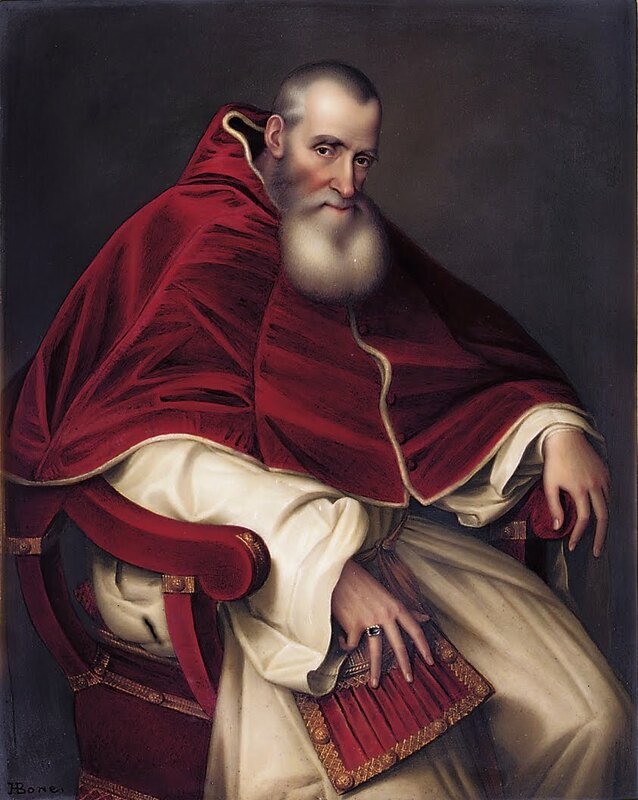 When the pontiff passed away Cardinal Farnese was elected pope in 1534 taking the name of Paul III. Like the stereotypical Renaissance pope, Paul III had four illegitimate children when he came to the papal throne and he quickly showed that the tradition of nepotism was still alive and well by appointing his teenage grandsons to the College of Cardinals. He later elevated his nephews to the rank of cardinal as well. However, also like other Renaissance popes, Paul III was a great patron of the arts. He employed Michelangelo in painting the “Last Judgment” in the Sistine Chapel, painting other frescos for the Vatican Palace as well as adding some finishing touches to the Farnese Palace in Rome. He commissioned numerous works of art and building projects adding to the beauty and defensibility of Rome. On the political front Pope Paul III was an admirable champion of the Catholic Reformation. He clashed frequently with King Henry VIII of England. When the King determined to execute Bishop St John Fisher for refusing to recognize his marriage to his mistress, Pope Paul III infuriated King Henry by elevating Fisher to the rank of cardinal just before his execution. Later he took the ultimate step of excommunicating King Henry VIII for divorcing his first wife and defying the authority of Rome. On the continent Pope Paul III first supported the Holy Roman Emperor Charles V in his efforts to defeat a Protestant alliance called the Schmalkaldic League and restore all of Germany to the Catholic Church. However, when the Emperor proved successful Paul began to worry that a too-powerful German Emperor might be a danger to the Church and he withdrew his forces. During this time Monaco was a protectorate of the Kingdom of Spain, of which the Holy Roman Emperor Charles V was king. It was the predecessor of Paul III, Pope Clement VII, who had advised Bishop Agustin Grimaldi, regent for Honore I, to ally with Spain and the Holy Roman Empire in the first place. It was while on his way to the Council of Nice that Pope Paul III stopped in Monaco for a visit, meeting with Seigneur Honore I who welcomed the Supreme Pontiff with all of the pomp and ceremony his tiny state could muster. Calling councils is one of the things Paul III is most remembered for. Despite his rather worldly reputation, Paul III was a great reformer who called the Council of Trent which finally got about the work of cleaning up the scandals in the Church that had provoked the birth of the Protestant movement. He also encouraged new religious orders which worked at reformation such as the Society of Jesus which he officially recognized in 1540. He also established the Roman Inquisition and condemned the enslavement of native Indians in the Americas. He died of fever at the age of 81 in 1549.